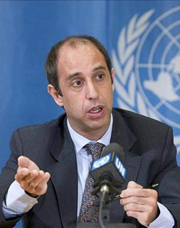 In March 2010, the United Nations Special Rapporteur on human rights in Burma, Prof. Tomas Ojea Quintana, urged the UN to establish a Commission of Inquiry with a specific fact finding mandate to address the question of war crimes and crimes against humanity in Burma. Quintana speaks to The Irrawaddy’s reporter, Ba Kaung, about how he sees the recent political and economic reforms in Burma affecting the country’s human rights situation. In this interview made on Friday evening when US Secretary of State Hillary Clinton concluded her historic visit to the country, the UN rights envoy said that the problem of impunity persists in Burma despite its reforms, and lack of independence can also compromise the performance of state-backed National Human Rights Commission in the country. Question: What is your opinion on US Secretary of State Hillary Clinton’s trip to Burma from the perspective of human rights issues in the country? Answer: I welcome the visit of US Secretary of State Hillary Clinton to Myanmar, and I hope this visit will encourage the government to face serious human rights shortcomings. At this juncture, one of the most important decisions for the government to take, definitely, is the release of all political prisoners. This is a decision that, unlike the situation in border areas and others that may require additional measures, depends only on the decision of the President. The President of Myanmar has the authority, according to the Constitution, to issue amnesties to prisoners without any other condition. And this decision cannot wait any longer. We must never forget that political prisoners are those women and men who offered their lives and liberty, their torture and their suffering throughout the years, to force the former military government to accelerate the so-called Seven Step Road Map to Democracy, a road map that, until the 2007 Saffron Revolution, the military government had been postponing and delaying. I hope, therefore, that the President of Myanmar takes the opportunity that the visit of the US Secretary of State offers, and responds to what the whole international community has been calling for: to put an end to the arbitrary detention of hundreds of political prisoners. The new Government of Myanmar, all political parties, and above all the people of Myanmar, they all owe these men and women behind bars the opportunity for a meaningful democratic transition, and the prospect for a better future. Q: Are you worried that the US approach to Burma might be premature given the unresolved ethnic conflicts and the continued detention of many political prisoners? Answer: Myanmar is going through an unprecedented momentum in its history, which may bring important opportunities. Bilateral relationships, then, may strengthen these opportunities, but I believe that these relationships should include human rights in the agenda, and the US Secretary of State has been clear on expressing concern for the detention of political prisoners and the situation in border areas. Q: There is much emphasis on some reforms the Burmese government has recently taken. To what extent have these reforms improved the human rights conditions in Burma? A:The government has taken clear steps towards reform, and we need to encourage them to continue on this direction. Now, again, why is it that political prisoners are seen to be the subject of bargaining with the international community? The Association of Southeast Asian Nations has decided that Myanmar will chair the organization in 2014, but why is it that hundreds of political prisoners are still in jail, prisoners, most of whom suffered extreme abuses in Myanmar prisons? Restrictions on civil and political rights seem to be gradually evolving, but the upcoming by-elections (although there is no formal announcement yet) will test to what extent this is translated into reality. The initiative for peace talks is of course welcome, but there are specific and very serious issues in respect to the conflicts that need immediate and strong measures. I am talking about the use of children, and forced labor by the military. Unfortunately what BaGyi wrote is true. We are CURRENTLY seeing the largest number of troops in the recent times in largest area of Burma than ever with largest number of people killed and maimed with amazing speed. Yet the responsibility lie not just on the military who are well known cowards ans thugs all along, but also on the now VOCAL so-called opposition who are prepared to put up so long as they can get in the cartoon like parliament for weird reasons. The brave and right initiation of Daw Bauk Ja is unfortunately going to be not well supported yet it a million times more important than the American visit. For the lack of understanding of what is important and what is mirage, the killings will get worse and will be more widespread. In the movie "The Leopard" by Visconti it was said " If we want things to stay as they are, things will have to change." The military learned well. They simply change the colour and the tactics. And they are at the top as they always have been. One should ask the question, who is making the rules now, who is enforcing it and who are the people affected by it. The answers to those questions have not changed for the last 20 years and still hold true. If the public is willing to swallow the lies and deceit of the military, being busy by oneself with such details as the count of prisoners and or child soldiers is the best one could do. As there will be no real change at all. Until the public are brave enough to see through the lies and deceit and ask for real change, it will not accidentally happen. It will take time to cure endemic specialy Rohingya.More than 50% parlimentry member don,t want to stablish democratic in Burma.We should struggle and workhard for democracy.
" all Burmese people owe these men and women behind bars ( political prisoners of the past and the present) for the opportunity for a meaningful democratic transition, and the prospect for a better future". We all Burmese should hang this beautiful phrase on the wall of our homes as well as on the walls of government buildings.
" I don’t see any government agency ready to start addressing the problems of discrimination, and the endemic situation of Rohingyas is a clear example." Absolutely right. Ye Myint Aung is still sitting in Geneva office. You will realize that you all(US,UN) can't do anything for those decade long human right abuse and war crime against than shwe although you have strong evidences. Instead of wasting your time and effort, try to save ethnics before too late by recognizing the ethnics' independence and autonomy. Then, UN can take action on than shwe's military thugs for foreign invasion. We, all are fed up with your lip-service or thousands of engagements with than shwe. You all now delay our democratic spirit and uprising. The Burmese rulers are too stingy to delegate even very limited authorities to the locals. We Kachin wants only to delegate reasonable administrative authorities to us, we do not even ask for the resource sharing. The atrocities in the Shan Kachin Karen areas are unspeakable and has been going on for five decades. Kachins are attacked at the scale of foreign invasion under this democratic guise Government of the War mongers. Now UNFC Army is in formation. Serious civil wars in all fronts (not yet ever experienced in the Burmese history) is imminent. If not handle wisely, millennium old civilization will be destroyed to the dust.